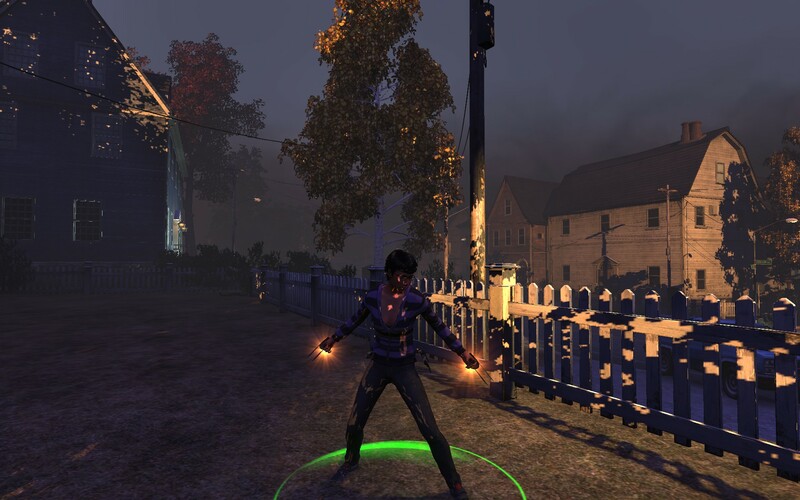 I’ve been enjoying more zombie killing in the first area of The Secret World, Kingsmouth. So far the unique skill tree and build mechanics have drawn me in, and I’m just barely outside the tutorial! I started with a Fist weapon, and paired it with Chaos magic. But I eventually shifted to pistols, partly because they are a range weapon, and partly because I decided to try a “low/no” magic route at first. I’ve only unlocked a few dozen skills, active and passive, but have a decent rotation that involves building resources with Fist attacks, then using a big Fist closer for extra damage. I’m nearly done buying the first tier of Fist skills (Feral and Primarl) and am looking forward to getting the initial elite skill, Go For The Throat. This initial zone has good atmospheric dread. And I also like the layout. For example, the city blocks have stores and homes on the street side, with an enclosed courtyard with playgrounds and backyards. It would be a nice place to live except for the zombie apocalypse. 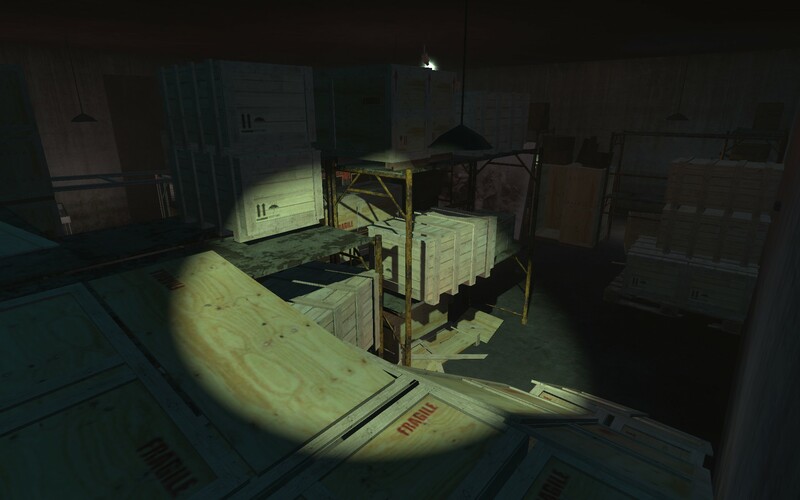 One mission that was a little frustrating was a stealth mission, where I ultimately had to make my way through a room, avoiding two moving spotlights. The frustration came from me being caught in the light when I thought I was fine. That’s OK, there didn’t seem to be a harsh penalty for retries! Anyway, I’m looking forward to wrapping up the initial side of the Kingsmouth map, and moving a bit deeper in. 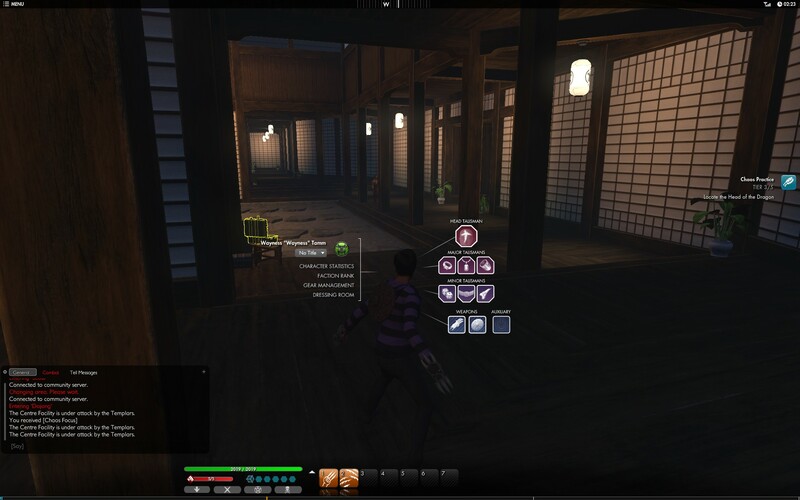 As well as opening up more Pistol skills and fiddling around with my deck (TSW terms for skill loadout). I’ve read, with great interest, about Wilhelm’s (TAGN) adventures in World of Tanks. Since the game is one of the many F2P variants, I decided to try it out. Despite not reading anything, not knowing anything besides what Wilhelm blogs about, and barely figuring out how to move and fire, I had a blast! After downloading the client and making an account, I logged in and clicked around the UI a bit. I found a research tree, a tech tree, various country tank trees, but decided against studying any of that stuff and just wanted to leap right into battle with my starter light tank. So I chose a random battle, and soon enough found myself on one side of a 10 on 10 fight. Right when the timer hit zero, I lurched forward and fired my tank, almost blowing up an ally who happened to be right in front of me. I guess the client masks keystrokes until the game is started – oops! Good thing I missed. We were in a city map, so I navigated carefully along streets until I entered an opening and spotted an enemy tank. At this point, I just charged in shooting, but got killed pretty quick. That was just a quick trial. I queued up again and this time played a little more carefully. For the next battle, I started with a random group, on a countryside map. As the timer counted down, somebody said “take the middle hill”. I figured they might be familiar with the map, so this was probably good advice. However, I just wound up following the 3 other tanks I started near. It looked like 2 other light tanks, plus a medium or heavy one. As a group, we approached some farm buildings. 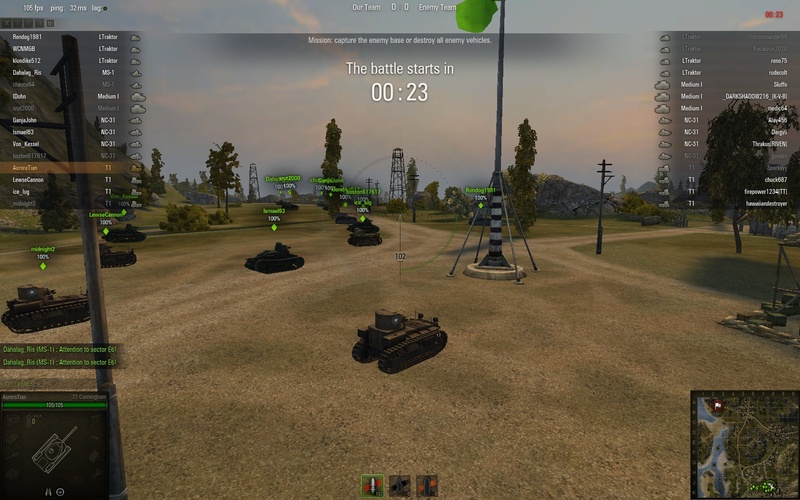 The radar showed an enemy tank on the other side, so we rolled through a small grove of trees and over some fences (that was fun in and of itself!) and started firing. I think that particular enemy tank was outnumbered 2 or 3 to 1, so he didn’t have much of a chance. After patrolling our section of the map, as a group we moved toward the center hill. Unfortunately I started taking some incoming fire, lost the ability to move, and was destroyed. 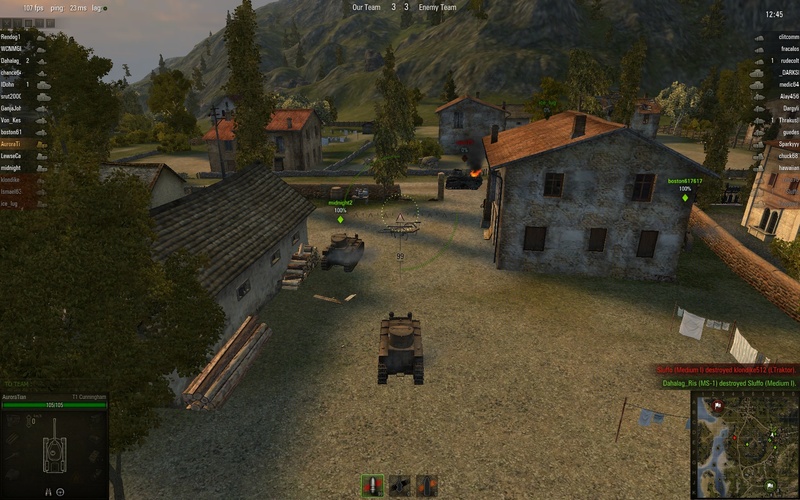 When that happens, you get the option to leave the game and return to your garage (probably to spend points on research, or fit a new tank), or what was really cool, stay and switch to a camera view of remaining allies. So I clicked around and watched my teammates continue to fight, for a few minutes. 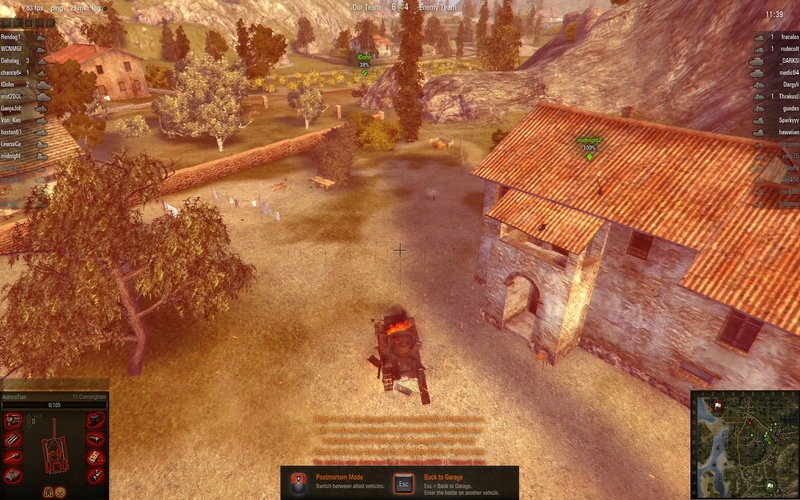 I had a fun time playing World of Tanks, and want to try out some more. I need to read up, a little bit, on research trees and also determine what exactly you need to pay for. I figure you can’t just get an infinite supply of tanks, surely they want you to buy something. Upgrades? Ammo? I’ve seen Wilhelm mention tank skins, so cosmetic stuff? Points that you can apply in a research tree? 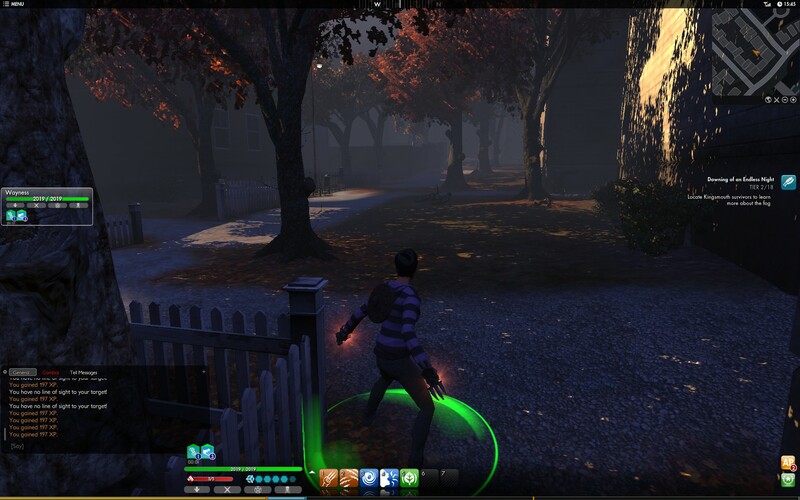 My curiosity got the better of me and I bought The Secret World. Several other bloggers are generally positive about it, so I figured even at $30 from Steam, it was a good deal (I missed that big sale in December when Amazon had it for super cheap. Missed it by an hour or so I think.) I could have waited, hoping for this title to go back on sale again, but I said what the heck and grabbed it. The game is set in the modern world, amidst various conspiracy theories, myths, and legends. I created a character and joined the Dragons, and made my way through the tutorial. After beating up on various training dummies, I decided to leave with Fist and Chaos weapons equipped. 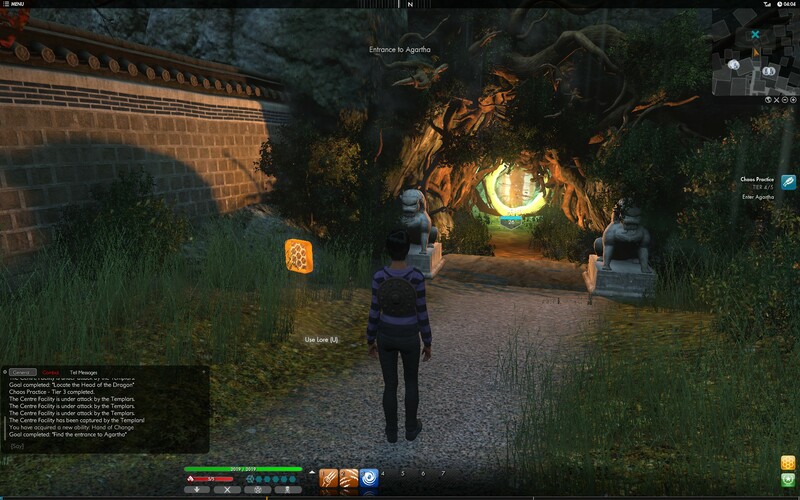 The intro mission led me to Agartha, which is a nexus between worlds. In game terms, it seems to be the travel hub where your character branches out to various locations for further exploration and adventure. 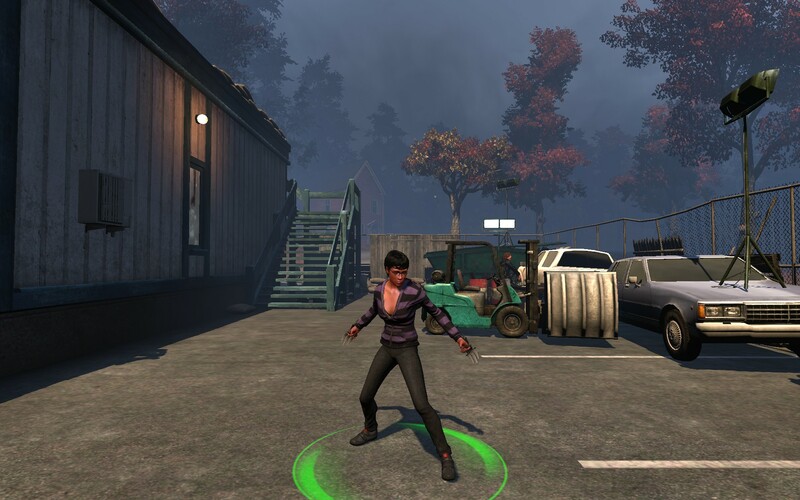 My first destination was Kingsmouth, overrun by zombies. I battled my way in, followed the mission instructions (kill zombies, investigate bodies, etc.) and made it to the police station. I didn’t get a chance to play for long, so I blew through everything up to this point, skimming over tutorial tips and so forth. My real goal was just to get a taste of the game and quick intro to the mechanics, and at a later time (ideally over the weekend when I can get a few uninterrupted hours) possibly redo with a bit more care. I did enjoy the bit I played, and am looking forward to more! For one thing, the skill system looks really interesting: equip 7 active and 7 passive skills from hundreds, divided between various weapons and magic. I’m resisting the urge to read up on everything, and thus trend towards min/maxing, and would like to instead just kinda go with the flow and discover stuff in-game. I do know from reading other blogs that the mission system is quite different as well – many missions require careful reading of the instructions or searching to discover the proper trigger point to advance. This all sounds good to me! I mentioned earlier I was going to try Planetary Interaction as a way to generate an income stream. So far I’ve made about 20 million ISK, averaging 1.5 million ISK per day. It’s decent income for the time spent, with some potential for future growth. However, I’m not rolling in ISK just yet – my wallet is still very low – because I’ve been reinvesting profits into expansion. In the meantime, I thought I’d share what I’m doing. This isn’t the best possible setup, for one thing I’m in high sec, but is a detailed example of how to go about producing 3 of the P4 (Advanced) commodities in a relatively non-time-intensive manner. There are many guides on Planetary Interaction – read and follow the links on EVE University’s page and go from there. As for specifics, that’s what my goal here is with this post. Look over the excellent chart by Karoi Larok. In particular, note that 3 of the P4 (Advanced) commodities can be made with 5 planets. Technically everything can be made with 5 planets, drawing out resources and shipping them back and forth in a complicated manner… what I mean is that some of the P4 (Advanced) commodities can be made by creating a single P2 (Refined) commodity on 4 planets, and then shipping those goods to a 5th planet where “final” assembly occurs. Those 3 Advanced commodities are: Nano Factory, Organic Mortar Applicators, and Sterile Conduits. For example, on an ocean planet, one extractor processes complex organisms into protein, another extractor processes micro organisms into bacteria, and the protein and bacteria combine to produce fertilizer. In this case, the 5th planet’s colony will extract and process base metals into reactive metals, combine the P2 (Refined) commodities from the other planets into industrial explosives and ukomi superconductors, and then produce a Nano Factory. These 4 skillbooks will cost about 2 million ISK total. There is another skill, Advanced Planetology, but you don’t need that starting out. 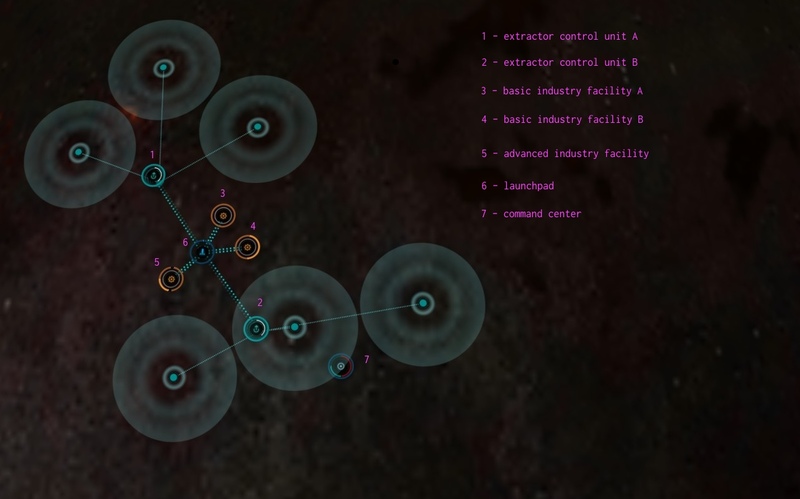 You’ll also need to have enough ISK to build 1 command center, 2 extractor heads, 1 launchpad, 2 basic industry facilities, and 1 advanced industry facility, plus link them all together. In order to power everything, you’ll need a minimum command center 3 upgrade. My rule of thumb is it takes about 4 million ISK to start out on a planet. The Planet Management skills don’t need to be maxed out, but as a minimum you’ll want to train a few levels of Planetology (so you can get a useful resource scan) and get Command Center Upgrades to 3 (so you can build a CC with enough power/cpu for the P2 commodity production). Each level of Interplanetary Consolidation lets you colonize an extra planet, so ultimately you’ll want that skill to be 4 (so you can build on 5 planets). If you are literally brand new and have no/minimal ISK, do the tutorial missions and then as much of the newbie epic storyline The Blood-stained Stars that you can. That should easily net at least 6 million ISK or more. Even starting on a single planet will work – it just means you’ll be reinvesting profits into expansion for a while in order to really get going. In order to make one of the P4 commodities I listed earlier, we’ll need to setup 4 P2 commodity planets, and then a P4 commodity production planet. Let’s use Nano Factories as the example: here we’ll want to find 4 planets: A) ocean or temperate, B) temperate, C) gas or storm, D) storm; and then later a 5th planet: E) barren. Start on planet A: ocean or temperate. 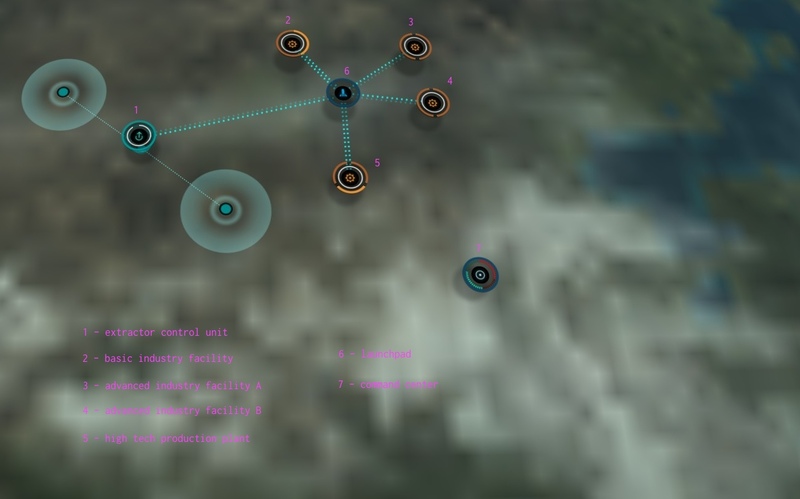 Scan the planet to get an idea of the resource distribution, then drop a command center (7). Upgrade the command center to at least level 3. Build an extractor control unit near complex organisms (1), build another extractor control until near micro organisms (2). Then, build a launch pad (6) in between the two extractor control units (1,2). Build 2 basic industry facilities near the launchpad (3,4), then build an advanced industry facility nearby (5). I like to build the 2 basic facilities near each other on one side of the launchpad, and the advanced facility on the other side, so I can easily identify them by their position. Now you’ll need to link everything together. Remember, the command center doesn’t need to be linked in (although if you do so it adds a bit of storage)! Link both extractor control units to the launchpad, link both basic industry facilities to the launchpad, and finally link the advanced facility to the launchpad. This way intermediate products flow through the launchpad on the way elsewhere for further processing, which makes the launchpad automatically buffer excess materials into its storage. At this point you should still have some power leftover for extractor head units, even at a control center upgrade of 3. Since we are specifically setting up planet A for a Nano Factory, we need to extracting complex organisms and micro organisms, producing proteins and bacteria, and then producing fertilizer. Select the extractor control unit near the complex organisms (1), select the “complex organisms” box to tell it what to extract, and add extractor head units (one or two head units for right now, but see below under Extractor Head Units). Click install to start it working. Do the same for the extractor head unit near the micro organisms (2); except of course have it extract micro organisms. Time to set the various schematics, which determine what inputs/outputs each facility produces. Select one basic industry facility (3), install the “proteins” schematic. Pick the other basic industry facility (4) and install the “bacteria” schematic. Select the advanced industry facility (5) and install the “fertilizer” schematic. At this point, you have configured the buildings and now need to route products. I like to start from the top and work down. Select the advanced industry facility (5), and route its product – fertilizer – to the launchpad (6). The final product will accumulate in the launchpad, ready for you to export! Select a basic industry facility (3,4), and route its product – protein or bacteria – to the advanced industry facility (5). As in, route straight to the advanced industry facility, don’t route to the launchpad and then route from the launchpad. By selecting the destination building, products will automatically flow through the launchpad (which marks the products are “transitioning” in its routing table). With the numbers from the diagram, route from 3 to 5, route from 4 to 5. Finally, select an extractor control unit (1,2) and route the extracted product to the appropriate basic industry facility (3,4). If you pick the wrong one by mistake (i.e. try to route complex organisms to the basic industry facility that is producing bacteria and thus expects micro organisms) it won’t finalize the route. This portion of the setup can be lots of clicking because you can only route 3000 units at a time. So if you are extracting 13000 units of product, you’ll need to make 5 routes – 4 for the 12000 units and then 1 more route for the leftover 1000. With the numbers from the diagram, route from 1 to 3, route from 2 to 4. Double check to make sure every product is sent along to the proper destination, by checking each building’s product and routing tab, and ensure nothing is listed as “unrouted”. Each Extractor Control Unit (1,2) can farm out up to 10 extractor head units. How many should you build? That depends on how much power you have leftover, and the balance of the resources. In summary, the more upgraded your command center, the more leftover power you’ll have to put into extractor head units, which lets you better balance the resources. What I do is try to get roughly the same P0 resources from the planet. Since resources are distributed differently, and you would be lucky indeed to find high concentrations of what you need nearby each other, you’ll likely wind up with a much better source of one resource compared to the other. This is where you can even that out by building different numbers of extractor head units. I start with an extractor head unit or two on both extractor control units and see how many resources are extracted. I’ll build more on the lower side. If you can’t, it just means your production will be throttled by the scarcer resource, which isn’t a big deal. After building up a surplus of the other material, you can switch around extraction strategies. The other 3 planets for a Nano Factory are setup in a similar fashion. So are the planets for Organic Mortar Applicators and Sterile Conduits. So that 5th planet for these 3 cases is the one that does final assembly of extracted resources and P2 (Refined) commodites, producing 2 P3 (Specialized) commodity intermediate products and a final P4 (Advanced) commodity. The high tech production plant can only be built on a barren or temperate planet, but in this specific case, that’s fine since the Nano Factory requires some extra P1 resources which happen to come from a barren planet (base metals -> reactive metals). Select the basic industry facility (2) and install the “reactive metal” schematic. Select one advanced industry facility (3) and install the “industrial explosives” schematic, select the other (4) and install the “ukomi superconductor” schematic. Select the high tech production plant (5) and install the “nano factory” schematic. Create links between all the buildings (except the command center) to the launchpad (6). Route the Nano Factory from the high tech production plant (5) to the launchpad (6). Route industrial explosives from one advanced industry facility to the high tech production plant (route 3 to 6), route ukomi superconductors from the other advanced industry facility to the high tech production plant (route 4 to 6). Route reactive metal from the basic industry facility (2) to the high tech production plant (5). Build a few extractor head units and get them extracting base metals. Route from the extractor control unit (1) to the basic industry facility (2). Wait a second… how do the advanced industry facilities (3,4) get their inputs? That is where export/import and hauling come in. You’ll need to export the P2 commodities from those other 4 planets that are cranking them out, and import them to this planet. Once you do that, the P2 commodities will appear in the storage area of the launchpad on the planet, and you can route them. For this case, route fertilizer and polytextiles from the launchpad to the advanced industry facility producing industrial explosives (route 6 to 3), and route synthetic oil and superconductors to the advanced industry facility producing ukomi superconductors (route 6 to 4). If that last step on the 5th planet is too much, just export the P2 commodities and sell them. What I do to keep the time spent doing this down is grab the P2 commodities once a week, import them to the P4 planet, and let it crank away. Then, reconfigure the extraction cycle on the planets and check in later. I also set a 3 day and 4 day extraction cycle (technically I do 2 days 22 hours and 3 days 22 hours) for every extractor control unit. That way I’m fiddling with PI on Sundays and Wednesdays (for instance) and each extraction ends early so that the time doesn’t creep later and later. Future plans include expanding every command center to support more extractor head units, spreading out to alts and get them producing P4 commodities, and so on. I look forward to eventually letting the ISK pile up slowly, which will let me bear the risk of loss better.